4km charity trail run, with 3 craft beer pint-stops, and a finish-line pint at The Fox! Returns on Saturday August 10th 2019! 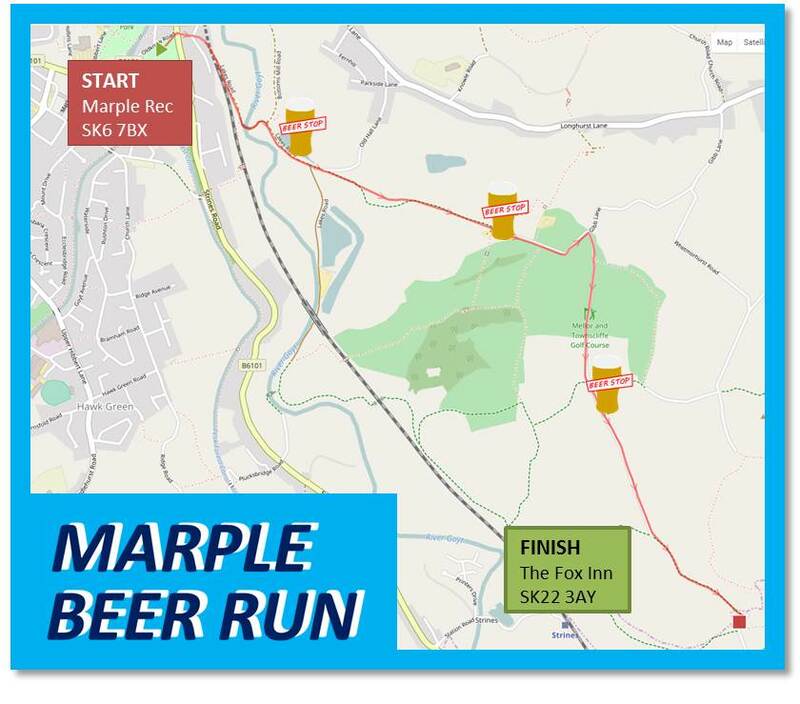 After a brilliant first (and second) year we now have records to be broken, and next year (hopefully) almost 200+ people will be heading off from Marple Rec on Oldknow Road to the Fox Inn pub, at 14:00 on Saturday afternoon, on a challenging 4km trail-run, with each hoping to become our new Champion! After every kilometre along the way, there’s an optional beer-stop, where participants can stop to drink a pint of delicious craft beer (this year supplied by 3 different local breweries!) – or a gin and tonic option is available. The finish line is the Fox Inn, where a nice cool beer is included in the entry fee, along with a buffet of food and hopefully some live music. The challenge is to complete the 4km run and drink 3 pints along the way (and the winner will get a prize! ), but it’s mainly an excuse to have fun, get out into the countryside, do some exercise, and, of course, drink beer. Oh, and make money for charity – at least £10 per participant goes to local charities, but more if we get more people. If you have any questions or comments, or want to get in touch for any reason what-so-ever then use this form and one of our team will get back to you ASAP!